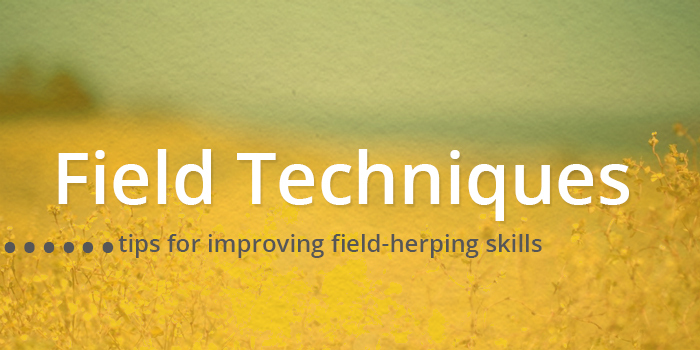 To verify an amphibian or reptile observation, it is critical to submit a voucher, either in the form of a clear photograph or series of photos; a recording, in the case of calling frogs; or an actual collected specimen. For the vast majority of observations, a voucher photograph will be the most practical. 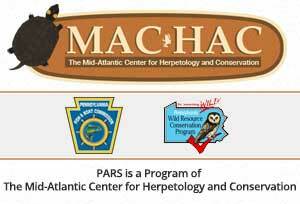 When taking voucher photographs to submit to the PARS website, it is important to remember that these photos will need to be viewed by other people to verify the species identification. The PARS Verification Committee must review each and every record. To make their job easier, and to ensure your hard-earned observations are not rejected, it is important that your photographs are as clear as possible and capture key characteristics for identification. Remember, these vouchers will be used for determining the ranges of species, and will potentially have conservation and regulatory implications. Records may remain unconfirmed because of blurry photos, or if photos do not capture sufficient identifying characteristics of an animal. While the identity of a specimen may seem obvious in the field, keep in mind that there may be other species with which it can be confused if certain features are not recorded. A simple example could be Eastern Ratsnake vs. Northern Black Racer. The adult phase of both species is normally black with a white chin, and this will often be evident in a photograph taken from a distance, or even in a blurry photo. 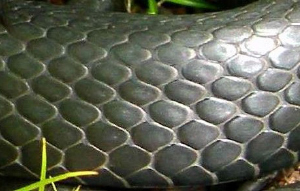 However, a key feature in differentiating between these species is the type of scales; ratsnakes have keeled scales (keels are ridges down the center of the scales), while racers have smooth scales. A photograph clearly showing this feature leaves no doubt about the identity of the species. Northern Black Racer scales are smooth. 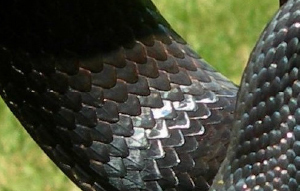 Eastern Ratsnake scales are keeled. Another good snake example is Eastern Gartersnake vs. Eastern Ribbonsnake. Eastern Gartersnakes are notoriously variable in color and pattern, and sometimes resemble Ribbonsnakes. 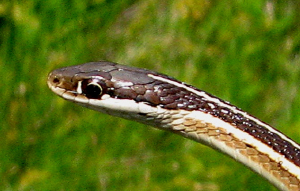 However, Ribbonsnakes have a white preocular scale (the facial scale immediately anterior to the eye) on each side of the head. A clear photograph of the face will ensure that this diagnostic feature is visible. 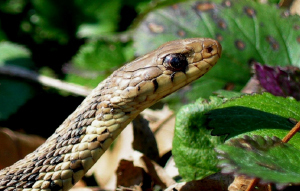 Without a clear headshot, these two species can still be differentiated with a clear photo of the snake’s side. Both species have lateral stripes, but these stripes occur only on scale rows 3 & 4 (start counting with the row of scales adjacent to the ventral scales) on Ribbonsnakes, and are confined to rows 2 & 3 on Gartersnakes. Notice the bright white preocular scale on the Ribbonsnake. Preocular Scale = The scale directly in front of the eye. Because of their excellent senses, basking turtles are often difficult to approach to get a close-up photo. When photographing aquatic turtles a good rule of thumb is to start snapping photos as soon as you spy them, and try to get shots from different angles. The glare from sunlight on a wet specimen can obscure key features, so whenever possible, approach baskers from a direction that minimizes glare. A photograph that captures the shell bridge (where top and bottom sections meet) can make a big difference in identifying distant basking turtles. If you are fortunate enough to get close to a basking turtle, try to capture a good head-on shot; the shape and color of the beak are important keys in species identification. With Softshells, it is important to be able to see the leading edge of the carapace in order to differentiate a Spiny Softshell from a Midland Softshell. Always photograph the carapace (top of shell) and plastron (bottom) of any hand-captured turtle. 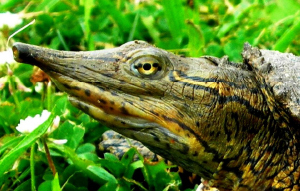 Eastern Spiny Softshell Turtle; note the spines on the leading edge of the carapace for which this species is named. It is critical to be able to clearly see this part of the shell to distinguish a Spiny Softeshell from a Midland Softshell, which lacks these spines. Fortunately it is usually not necessary to get this close of a shot to be able to see these spines. Lizards are always challenging to photograph and skinks are particularly tricky because a good facial close-up can be critical in distinguishing a Broadhead Skink from a Common Five-lined Skink. These two species are variable in pattern, and often resemble each other, particularly young specimens. Being able to clearly view and count labial scales (scales on the upper lip), and post-labial scales (scale immediately anterior to the ear opening), if present, is sometimes the only way to differentiate these two species. To make matters more complicated, both sides of the face should be photographed whenever possible. 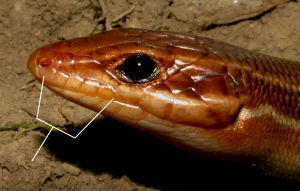 Broadhead Skinks are supposed to have five labial scales on each side of the face, but sometimes will have only four on one side, and occasionally have four on both sides. Five-lined Skinks normally have only four on each side. Five-lined Skinks also have two small post labial scales, which are typically absent in Broadheads. Always photograph the dorsum of any lizard. The three species of Desmognathus (Dusky) Salamanders found in Pennsylvania are highly variable and can be difficult to properly key out, particularly where ranges overlap. It is always a good idea to try to make sure at least one photograph clearly shows the dorsum and side of the head of any salamander, to at least arrive at the correct genus. All dusky salamanders have nasolabial grooves and prominent jaw muscles, and there is often a faint line that runs from the corner of the eye to the jaw. These features are usually enough to denote a Desmognathid, but nice clear views of the dorsum, venter, side, and the tail are often necessary to key out the species. Allegheny Mountain Dusky Salamanders have a tail that is round, while the tail of the Northern Dusky and Seal Salamander is laterally compressed for approximately half of the length. The dorsal pattern of the two latter species can be very similar, but the venter of the Northern Dusky Salamander is usually mottled, and there is often no clear demarcation between the dorsum (top) and venter (underside). Seal Salamanders usually have pale, un-patterned venters, and a clear side view will reveal a obvious separation of dorsal and ventral coloration. Differentiating Eastern American Toads from Fowler’s Toads in photographs can be particularly challenging without close-ups taken from multiple angles, including the venter of the animal. Both species are highly variable, and we won’t even go into the fact that they sometimes hybridize. 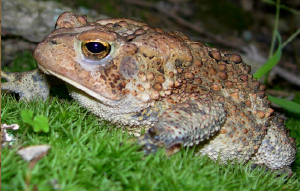 In the classic scenario, Fowler’s Toads have more than three ‘warts’ within any dark spots on the body, while American Toads have no more than two or three. In reality however, this is not always the case, and other features need to be considered. 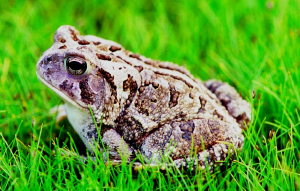 Fowler’s Toads usually have an immaculate venter with one spot in the chest, while the venter of an American Toad will usually have some bold markings. There is normally a clear separation between the cranial ridges and the parotid glands (the large swelling behind each eye) on American Toads, whereas these two feature touch on Fowler’s Toads. This is the most dependable feature for differentiating these two species, so photographs should highlight it. Finally, the warts on American Toads are often ‘spiny’, particularly on the face and legs, while most warts are normally not spiny on Fowler’s Toads. 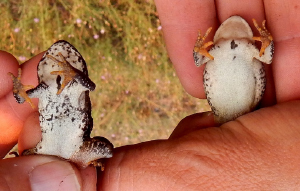 The photo on the left highlights the difference in the venter; that of the Fowler’s Toad (right) is usually clear, except for possibly one spot in the middle of the chest. There are numerous other examples that can be given but by now the message is probably clear; whenever possible, try to get clear photographs from as close to your subject as possible, and try to get images from as many different angles as possible. For animals that are hard to capture, start snapping photos as soon as you see them, and keep clicking as you approach. One of the great things about digital photography is that there is no need to worry about wasting film, as some of us old-timers used to do. While encouraging close-up photographs of specimens, the PARS project does NOT encourage the handling of, or closely approaching venomous . If you cannot identify the snake in front of you, do not attempt to closely approach or handle it.